52. Attract and feed hummingbirds safely. 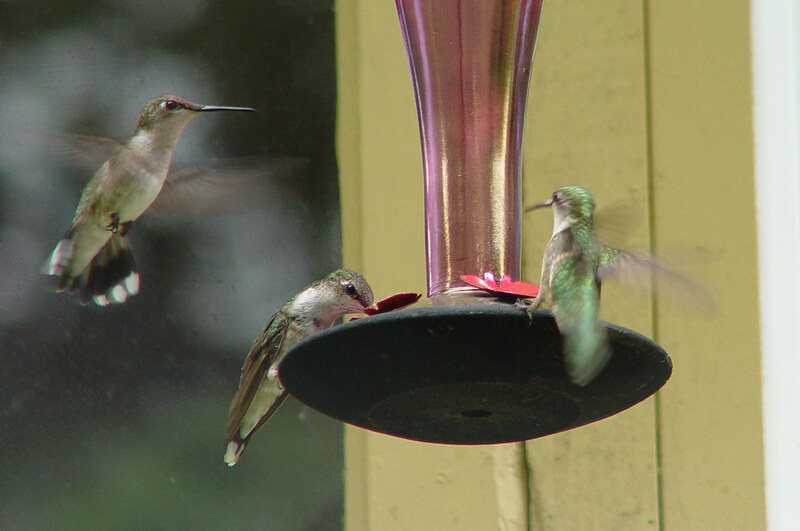 UPDATE: Sheri Williamson has produced a great and authoritative webpage about feeding hummingbirds. Hummingbirds are lovely and enormously entertaining. Because of their extraordinary mtabolic rate (hummingbird hearts have been recorded beating more than 1,200 times per minute), they need a lot of fuel relative to their size to sustain life. Ruby-throated and Rufous Hummingbird eggs are as tiny as peas. The embryos may die if the eggs become chilled, so female hummingbirds must be able to feed and return to their nests very quickly during cold or rainy weather, especially if the temperature is below freezing. 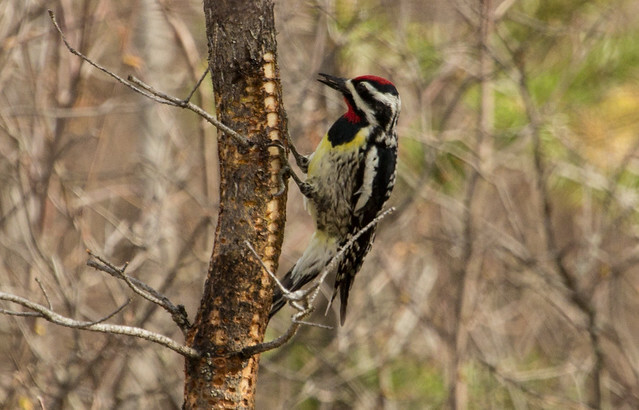 Abundant food resources can mean the difference between nesting success and failure. Sugar water is the standard hummingbird feeder fare. Under normal circumstances, you can use one-quarter to one-third cup of sugar per cup of water. Natural nectars vary in their sugar content, and these concentrations are within normal ranges. During cold, rainy periods, it’s not a bad idea to keep it on the strong side to provide needed energy; during drought conditions, use less sugar to prevent birds from becoming dehydrated. When you mix just enough solution to use right away, there’s no need to boil the water. Never substitute honey for sugar—the water becomes cloudy, and fungus and bacteria grow far more readily in honey than in processed sugar. Food coloring is unnecessary and may be harmful. 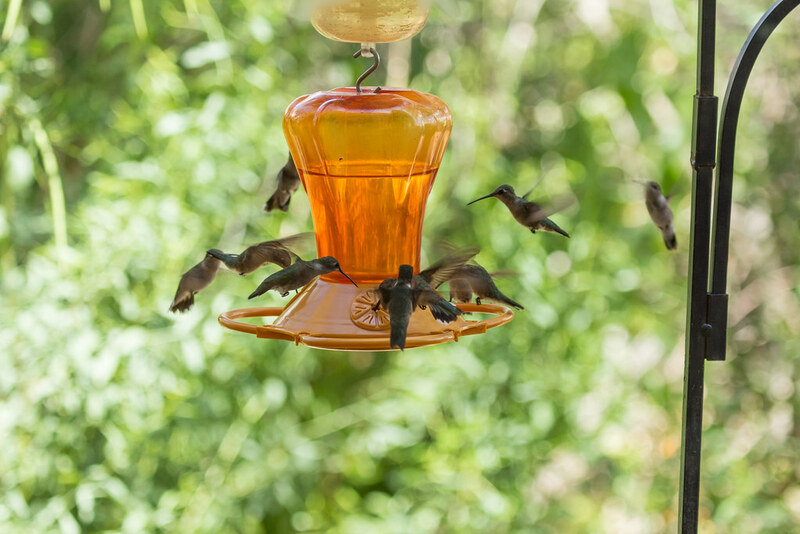 The color and design of hummingbird feeders are what attract hummers. I never use commercial hummingbird mixtures, which are simply sugar and artificial coloring. Plain sugar is cheaper and probably healthier. I know of one report of a hummingbird collapsing with hypothermia while feeding from a perch on a cold morning. The person who reported this believed that as the bird filled up with almost freezing water, its body temperature dropped to critical levels. He suggested using feeders without perches during cold periods, since muscle activity from hovering helps maintain body temperature. Although I don’t know of any studies that have replicated these observations, it’s a good idea to set out fresh hummingbird nectar first thing in the morning, so the water will be warmest when the birds are coldest. 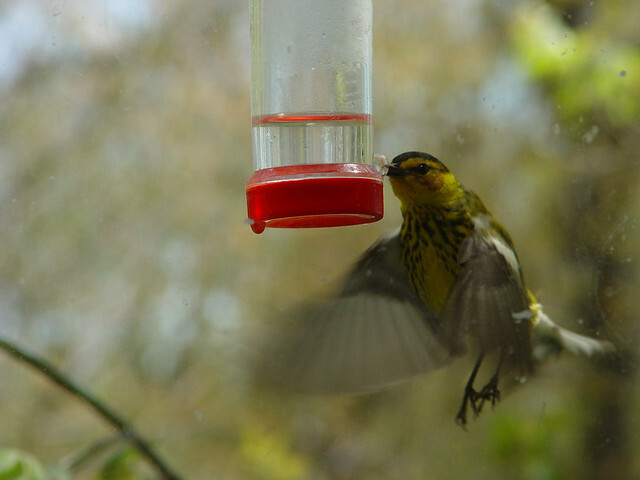 One cold spring morning, a Cape May Warbler learned to hover for a few seconds at a time at my window hummingbird feeder, coming many times a day for over a week. The greatest danger to birds from sugar water is spoilage.Fungus and bacteria flourish in it, especially in warm weather. In addition, sugar water ferments, forming alcohol and other organic compounds, This process also happens more rapidly in warm weather. Hummingbirds feeding on sugar water that has been left out only three or four days can develop enlarged livers, so it’s important during warm weather to change the solution frequently. It’s also a good idea to keep hummingbird feeders in the coolest, shadiest places available. 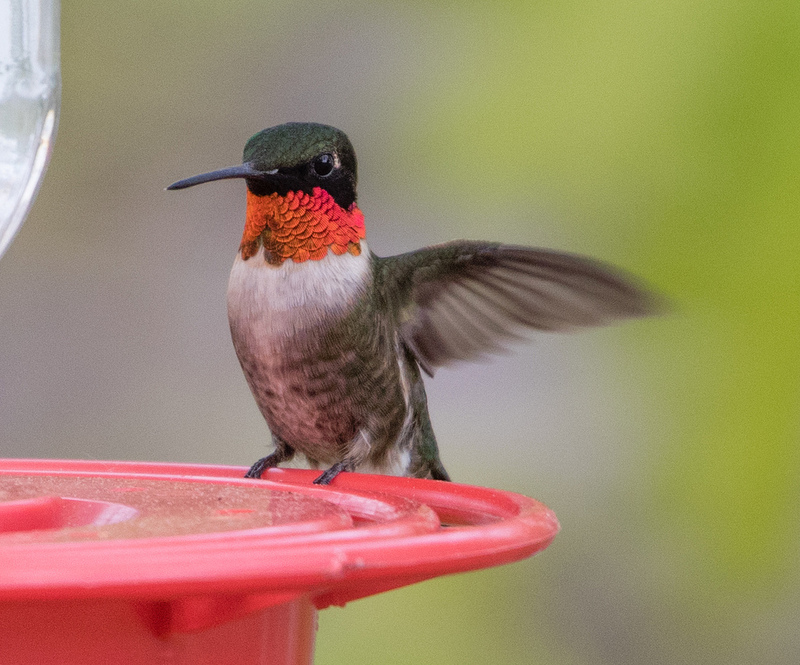 Hummingbirds are extremely territorial and tend to chase one another away from feeders, so to accommodate the most hummingbirds and keep the water freshest, it’s better to set out five or six small feeders with one or two ports each than to set out one or two large feeders with five or six ports each. Wasps harass hummingbirds and can sting and even kill them. To protect your hummingbirds, use bee guards on your feeders. If they still cause problems, Carrol Henderson recommends discouraging bees and wasps by rubbing Avon Skin-So-Soft, Off Skintastic, or other repellents around the feeder ports. Be careful not to get these substances near the nectar, however. 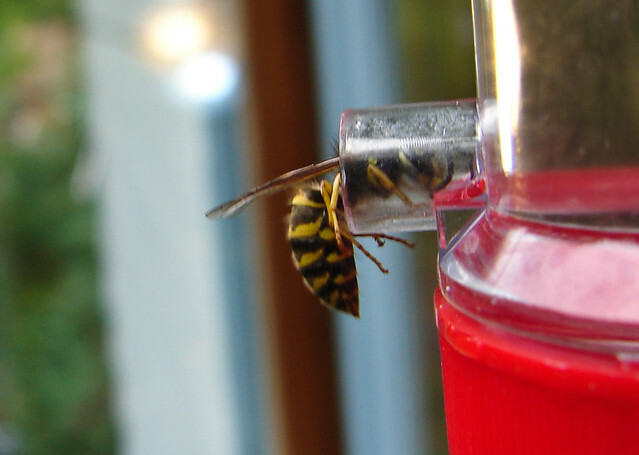 One summer when I had a serious problem with yellow jackets, I started vacuuming them out of the hummingbird feeders. Within an hour of the first time I did this, a couple of my hummingbirds figured out that the noisy vacuum was vanquishing the wasps and started hovering at the windows, making chittering sounds. One female would repeatedly tap on the glass and stare at me to alert me that wasps were present. I’d crank the window open and start the vacuum while the hummers perched or hovered just two or three feet away. 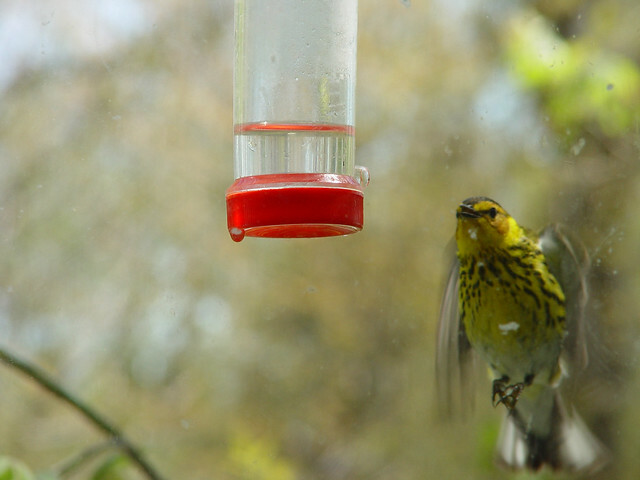 They’d zip over to the feeder the moment I turned off the vacuum, before the window was even closed. Ants are also attracted to hummingbird feeders. Smearing a dab of petroleum jelly or insect repellent on the wire holding a suspended feeder can keep ants at bay. Some hanging hummingbird feeders have an ant guard, a middle section of the feeder that can be filled with water. This works like a moat at the castle door to keep ants from crawling into the feeder. No matter how bad an ant or wasp problem is, never use pesticides near hummingbird feeders. 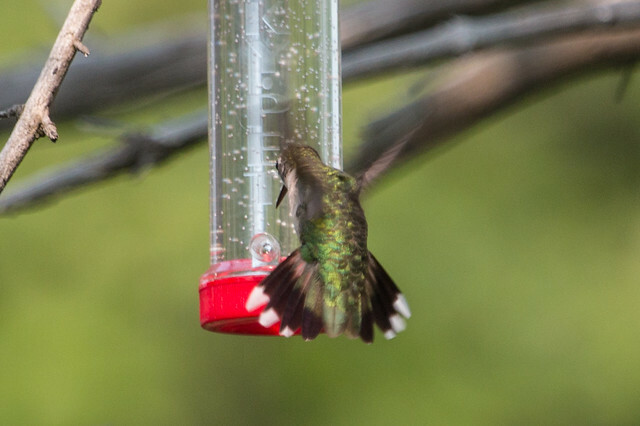 Sugar water is not sufficient to sustain hummingbirds for any length of time. Hummingbird gardens are the best source of both nectar and insects. There are many resources available to help you select appropriate hummingbird plants for your area. Flowers that attract many small insects are just as important as flowers that produce a lot of nectar. One interesting way of providing insects, suggested by Carrol Henderson, is to set out chunks of melon or banana in a mesh bag. 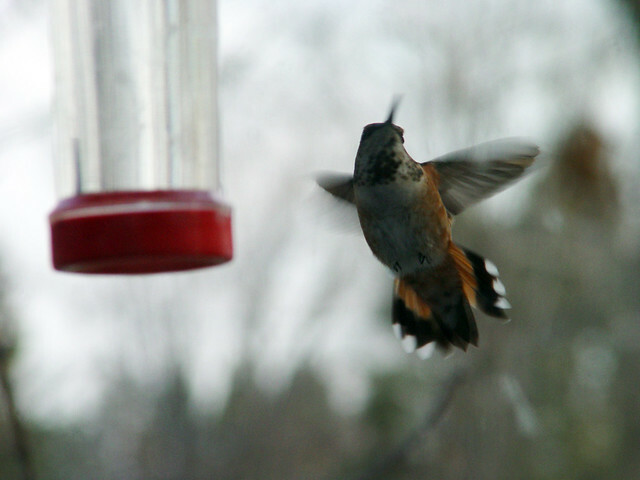 Hummingbirds and other fly-catching species can dart at the bag and catch the fruit flies that appear. In fruit-growing agricultural areas, this may not be a wise idea. Encouraging spiders and fostering lichens will help local hummingbirds, which use lichens and spider silk in nest construction. 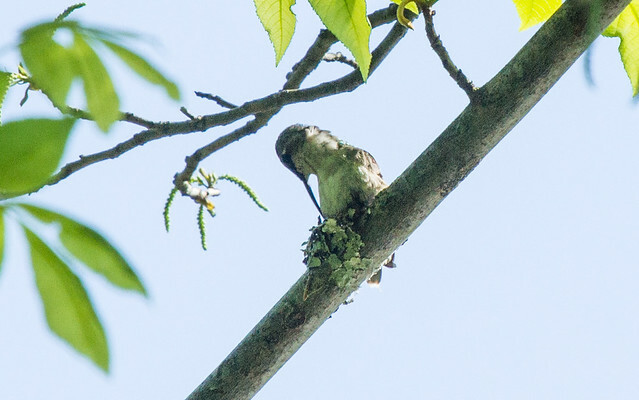 Some hummingbirds prefer to build their nests near trees where sapsuckers are maintaining fresh drill holes, which guarantees a nearby source of food and minimizes the amount of time they’re off the nest during incubation. So fostering sapsuckers will also encourage hummingbirds. Many people believe that keeping feeders out into autumn will entice hummingbirds to remain in the north longer than they should, but that simply isn’t true. Immature hummingbirds may remain at feeders for weeks after the adults migrate, but especially in the case of Ruby-throated Hummingbirds, the young birds have such a powerful migratory instinct that they will leave as soon as their muscle mass and fat levels can support the rigors of the flight. Anna’s, Rufous, and Calliope Hummingbirds and Green Violetears occasionally find themselves farther north in late fall and winter than a hummingbird would normally be. This represents normal variation and may be augmented by lower survival rates in the tropics, where competition for dwindling habitat is getting worse. More Rufous Hummingbirds appear to be wintering in the United States, but this is only tangentially related to and supported by bird feeding. 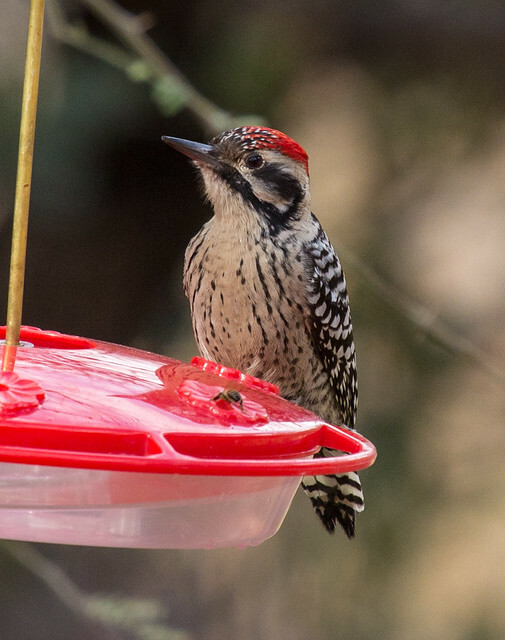 Although feeders clearly help these individuals and may ultimately contribute to the success of birds with a genetic tendency to remain farther north, the feeders do not entice them to stay; they simply provide some assistance to the birds that choose to do so. In years when nesting is late, young birds that would otherwise starve may be kept alive longer, or even be able to get their weight up to attempt migration, if they encounter late feeders. An immature Ruby-throated Hummingbird once stopped at my feeding in October, long after I thought I’d seen the last one of the year. It took a long, filling drink and then moved on. The feeder may have given it a needed boost during its travels, but it did not entice the bird to remain. 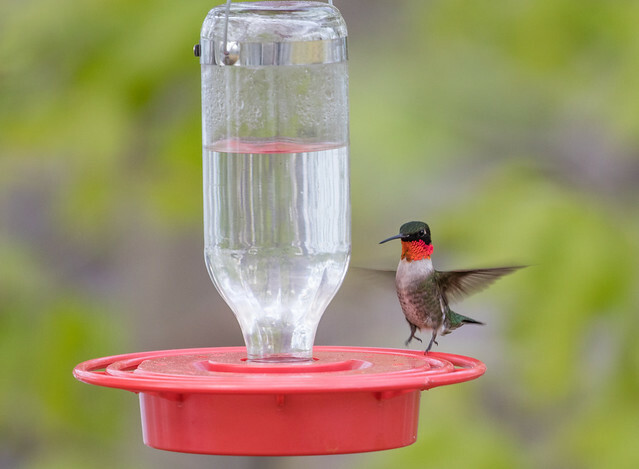 In the event that a hummingbird remains in your area after normal fall migration, when flowers and insects are no longer available, adding protein to a sugar water mixture can help it survive and remain healthy. Special commercial hummingbird mixtures such as Nektar Plus are ideal. These spoil extremely quickly, however, and should be used only in exceptional circumstances. When a Rufous Hummingbird appeared at my feeder one November, I mixed mealworms in a blender with a sugar water solution to provide her with protein. This sustained her during several freezing days when no wild insects were available. I had six hummingbird feeders out, but only one with the mealworms added. When temperatures were below 20 degrees Fahrenheit, that was the feeder she visited at least 90 percent of the time. When hummingbirds turn up in northern areas in winter, they’re likely to be unusual species wandering outside their normal range. If you happen to observe an out-of-season hummingbird, notify the local bird club or state ornithological society, and expect birders to start arriving to study the bird. Some species are hard to distinguish in the field, so birders take a lot of photographs for documentation. There are about fifty banders in North America specifically licensed to handle hummingbirds. These people have a lot of experience and know how to capture and measure these birds safely. Only a few of these individuals have a special endorsement that allows them to remove a tail feather to verify identification. Although a feather can be extremely useful for identifying a rare species, removing one in the case of a wintering hummingbird doesn’t seem warranted. Whenever a feather is removed, the bird’s body instantly starts diverting energy and nutrients into feather production. This isn’t a problem when resources are abundant, but in times of scarcity or when a bird is already stressed by low temperatures, it seems less justifiable. Usually, photographing the tail feathers of a bird in the hand provides all the documentation necessary for accurate identification. 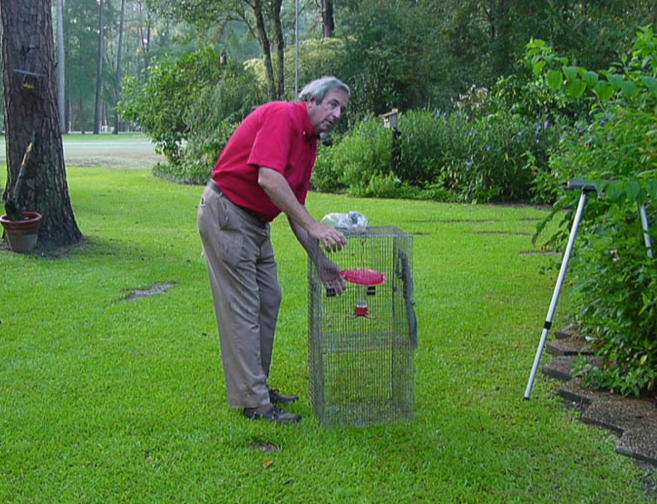 Trapping the bird in a cage trap is much safer than using a mist net, where the bird is more likely to lose feathers and be hurt or stressed during removal. The U.S. Fish and Wildlife Service no longer issues permits allowing people to trap out-of-range hummingbirds to move them to “more appropriate” areas, partly because the vast majority of birds died during capture or transport. Hummingbirds are surprisingly hardy. The Rufous Hummingbird that visited my yard survived both a blizzard and a night when the temperatures dropped to 6 degrees Fahrenheit. But sadly, some wintering hummingbirds do die. Because information about the bird’s species and body condition at the time of death is valuable and may ultimately help other hummingbirds, it’s a good idea to retrieve the carcass of any winter hummingbirds that succumb. By paying attention to where a wintering hummingbird roosts during the day and at night, observers have a better chance of finding a body if the bird suddenly stops appearing. If the bird appears throughout one day and then doesn’t appear the next morning, chances are it died overnight. If it stops coming at midmorning, chances are good that it moved on.